Clean plain text widget showing astrid tasks? Discussion in 'Android Apps & Games' started by quam6246, Sep 22, 2011. I'm looking for a simple elegant looking widget to show my astrid tasks. Basically, I would like something that looks like the simple calendar widget, but for tasks instead of calendar items. Does anyone know of any widgets like that? I'm using pure calendar right now, but I can't seem to find any of the skins that even approach the look I'm hoping for. You can see the look that I'm going for with the screenshots of the simple calendar widget on the market. Sorry, but the forum won't allow me to post a screenshot because I just registered. 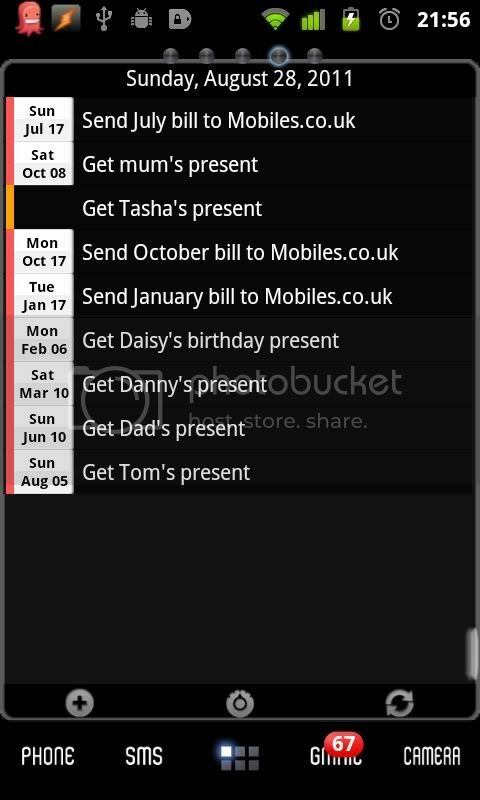 Android agenda widget. You can set it to scroll and can show a view of both Astrid and the Calendar app entries. There's a theme there, I think it's "nothing but nebula", that just looks like a bunch of floating backgroundless text of your calendar entries and astrid tasks. You can also personalize the themes to your liking. Thanks for the suggestion. I'll give it a try. Here's my Android Agenda Widget. All clear actually using a 3x2 widget (dont mind the big date thing, its a Minimalistic Text widget), Nothing But Nebula theme, Date Row set to be completely transparent and in "inline" style. The entire widget is also set to scrollabe. You can also see two "whitish" lines on the side, near the top and bottom of the widget's right border. When you press the top one, it will show a fullscreen view of your agenda, then the bottom one goes to the settings quick menu. chanchan05- Thanks for the screenshot, that is just about exactly what I wanted to end up with.